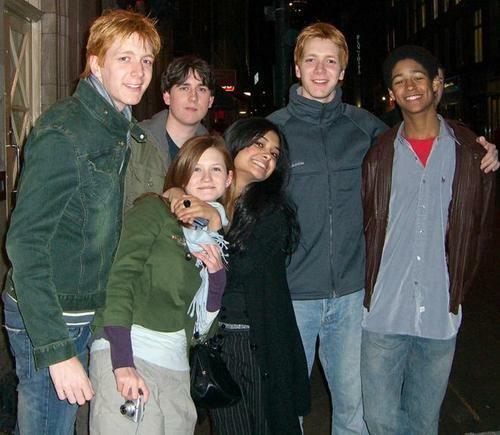 James, Oliver, Bonnie & Matthew. . Wallpaper and background images in the Harry Potter club tagged: harry potter cast james phelps oliver phelps bonnie wright matthew lewis. This Harry Potter photo contains groene baret, speciale krachten, elite soldaat, speciale troepen, goed gekleed persoon, pak, broek pak, broekpak, kostuum broek, and vermoeienissen. There might also be jurk blues, jurk whites, jurk van blues, blanken jurk, box coat, vak jas, bovenkleding, and overclothes.